Anyone who has learned a second language knows what a challenging task it can be. Even accomplished linguists complain that some terms or phrases can be difficult to recall, especially when there’s no direct translation from their native language. The issue is compounded when writing professionally, such as in business emails that include technical terms or industry jargon. This is certainly true for Julian, who is a researcher for a US biotechnology firm that markets a dehydration preventive. Their innovative product helps patients undergoing treatment for serious diseases such as cancer – treatments that cause dehydration which, in turn, causes other problems. While Julian is fluent in both Spanish and English, explaining the details of the company’s product and research in technical terms can be challenging, and there are instances where his use of phrases differs from that of a native English speaker. “I write emails on a daily basis to physicians and executives of healthcare companies. The words I use are very important. Hydration is critical, and our product needs to be explained concisely and with great accuracy,” he says. 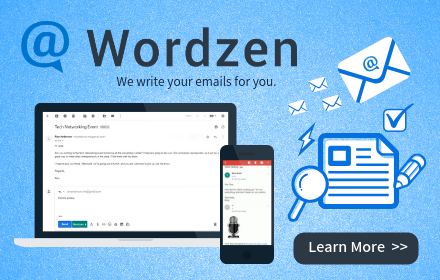 Wordzen’s experienced editors review emails and then rewrite them for clarity and tone, ensuring that they present impeccable grammar, perfect spelling, and proper punctuation. The editing service is particularly useful for people who write a lot of business emails, even outside of their regular business hours. It’s easy to sign up for Wordzen. All you need is Gmail and the Chrome browser; then visit www.wordzen.com to add the program to Gmail. Wordzen is a paid service, but there is a free trial for new users.